We were delighted to see Jian Yi Kok receive a 2017 CIFE Award for his exceptional contribution during his time at Cambridge Tutors College. 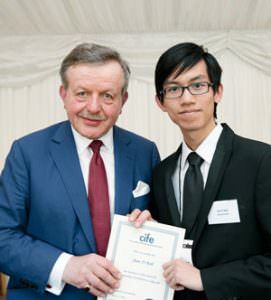 He received the award from CIFE President Lord Lexden at a ceremony in the House of Lords this April. Jian Yi joined CTC from Malaysia onto our 18-month accelerated A-level course. We awarded him a scholarship on the basis of his previous excellent academic performance and he has certainly lived up to our expectations. He took four subjects on the 18 month A level course in Mathematics, Biology, Physics and Chemistry and attained A* grades in all three sciences and an A in Mathematics. Jian Yi has an interest in evolutionary biology and he pursed this through his EPQ, which was based on the evolution of altruistic behaviour in the animal kingdom. He contributed to our College magazine with articles as diverse as a piece on ‘England’s Hidden Gems’ and a review of the anime, ‘Death Note’. Jian is now studying Natural Sciences at Cambridge.